Elaine Live & Lauren, Too! Ep. 200 Our 200th EPISODE!!! Ep. 198 How to keep your sales funnel from leaking all over your profits. Ep. 186 What’s in a name? That which we call a rose, Sharon Lynn Wyeth shares how it smells as sweet for your business. Ep. 160 Your Buyer's Journey: A.I. Creating Squeeze Pages, and How You Write. Ep. 140 Reasons NOT to Hire a Coach and How to Market a Whole Town. Ep. 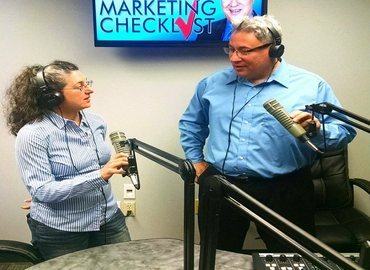 128 Over 50 Marketing Tips on 5 Lists to Improve How You Do What You Do! Ep. 126 Hurt your Brand, Help your Brand... it's up to you! Ep. 123 Crisis Management and Writing a Book in 2 Days! Ep. 110 Oh Gawd! Do I Have to Blog? Ep. 103 Ricky Powell - My Awesome Life Starts Now...Plus tips to make your Explainer Videos better. Ep. 99 100th Episode Extravaganza! Ep. 55 Using Music and Art to build your business. Ep. 54 What a year. Then there is Disney. Ep. 52 Jazz Pinca of Modtech/Global with a TV breakthrough. Its portable. Will it replace cable. Ep. 42 How CPAs Can Build Their Practice. Ep. 37 Live from Sedona. New employee Katy. Ep. 28 Kathleen Sterling on starting a newspaper and how effective one is.